Geogrids are high strength oriented polymer grid structures used to reinforce soils & are made from high Tenacity polyester yarns, when coated with Poly Vinyl Chloride they make a strong, durable & dimensionally stable geogrid. Our product is highly recommended for reinforcement of soils & other granular materials for a wide variety of applications including soil retaining walls. Maruti Geogrid¿¿¿ has good tensile strength, low elongational ratio & high occlusive force with soil or gravel which is ideal for soil reinforcement purposes. Maruti Geogrid¿¿¿ is resistant to UV rays, bacteria attacks and aging resistant &has a product life of about 75 to 120 years. Advantages ¿¿¿¿High static and dynamic load carrying capability. ¿¿¿¿Low material and installation costs. ¿¿¿¿Effective utilization of land. ¿¿¿¿Pleasing appearance-panels maybe given a variety of architectural treatments. 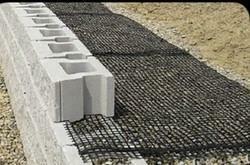 ¿¿¿¿RE walls distribute loads over compressed soils, reducing the need for deep foundations. ¿¿¿¿Ease and speed of installation-Prefabricated materials and granular soil simplify construction.